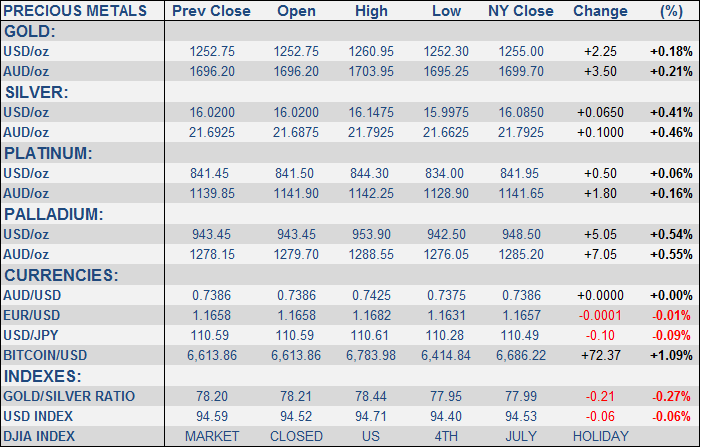 After some respectable bounces across the precious metals complex on Tuesday which had resulted from booksquaring ahead of the Independence Day holiday in the US on Wednesday, yesterday’s activity was expectedly curtailed and largely featureless within ranges. XAU/USD: Whilst Tuesday’s bounce was positive from a technical perspective and may signal that to all intents and purposes a technical “double bottom” has been posted near the USD 1236.50 level, if the buying was merely booksquaring / shortcovering ahead of a market holiday in the US, it may yet prove ephemeral and therefore it remains to be seen which direction US investors will take the metal when they return on Thursday. That notwithstanding, XAU/USD is locked within a triangular congestion region bounded by support at the mid-December 2017 low at 1236.50 and (down) trendline resistance. A move back towards USD 1275 followed by a close above the trendline resistance line presently located at USD 1291.50 would be needed before continued downside risk could be safely consigned to the “low probability” category. USD 1236.50 represents a bit of a technical ‘line in the sand’ for gold which if left undefended by bullish speculative interests, could see a quick unravelling down towards psychological big-figure support at USD 1200 and the low seen this time last year at USD 1204.50. XAU/AUD: After flirting with its technically significant 200 Day moving average at AUD 1692.00, XAU/AUD has managed to avoid a close beneath and has a good chance of moving back towards the 55 Day moving average at AUD 1722. A break and close beneath the 200 Day moving average however, would then open the way back to the mid-March low at AUD 1670 and late January lows at AUD 1652.00.